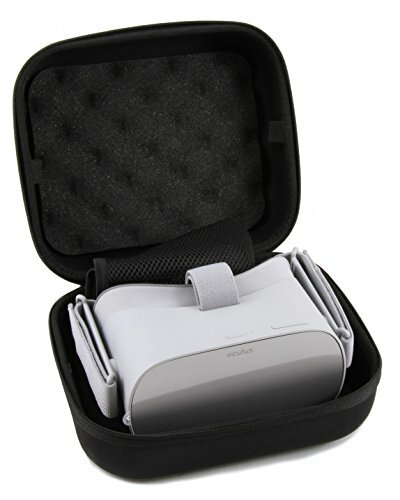 Internal padded compartment fits the Oculus GO and the remote and charger can be stored next to it in the included accessory bag. Durable EVA nylon exterior and dense foam interior provides protection for your virtual reality headset at all times. The Foam interior lines the top and bottom lid providing soft padded protection from all sides. Keep your headset looking brand new , dust free and the lenses protected from scratches. The foam softly presses down on the Oculus GO to reduce vibration and movement within the case. This case has a rubberized built in carry handle to conveniently carry your VR headset by your side. It is constructed from premium materials to hold up to the elements and heavy-duty zippers to prevent jamming. Exterior dimensions measure 9.5" x 8" x 4.5" and allow the GO and accessories to stay organized when traveling. The padded foam Interior softly presses down on the Oculus Go Virtual Reality goggles to absorb impacts, reduce vibration and prevent movement within the case.